Charles “Chuck” Stark, regional vice president for South Texas Health System, speaks to visiting legislators at Edinburg Children's Hospital. EDINBURG, RGV – Access to healthcare, a Level 1 trauma center and student loan forgiveness for those studying in the medical arena are among South Texas Health System’s legislative priorities this year. Charles “Chuck” Stark, regional vice president for South Texas Health System, ran through his group’s top agenda items for the 86th Legislature in an exclusive interview with the Rio Grande Guardian and RGV Public Radio 88 FM on Saturday. The interview took place at STHS’s Edinburg Children’s Hospital as Stark and his leadership team welcomed visiting legislators during the the Valley Legislative Tour hosted by the Rio Grande Valley Partnership. Stark said the key point he wanted to get across to the visiting legislators was that hospitals are major economic engines for their communities, as well as taxpaying enterprises and large employers. “This is a great opportunity for the legislators to learn about the challenges in healthcare, to understand that access is important and financing is important,” said Stark, at the beginning of the interview. Asked if he had had a chance to discuss his views on healthcare one-on-one with the visiting legislators, Stark answered affirmatively. “I am intrigued by their openness and desire to learn about not just what makes us unique in the Valley but what they can do when they get to Austin to help further the needs we have down here throughout the Valley,” Stark said. Healthcare has been a major component of the four-day Valley Legislative Tour. The first event on the tour was a reception hosted by Valley Baptist Health System in Harlingen. Just prior to the visit to Edinburg Regional Children’s Hospital, which took place on Saturday afternoon, the legislators toured Doctors Hospital at Renaissance, also in Edinburg. One opportunity the State of Texas has to improve access to healthcare, Stark said, is securing additional federal funds. “We leave $1.5 billion of federal funds on the table that we could get. And it is not Medicaid expansion. This is looking at what our uncompensated care pool is. CMS has artificially capped how much we can pull down as a state,” Stark said. CMS stands for Centers for Medicare and Medicaid Services. “There is an opportunity to look at what Tennessee did and, working with CMS, change the access to care and funding to help fund access to care,” Stark said. In addition to improving access to healthcare, another top legislative agenda item for STHS is securing Level 1 trauma center status. “We are a Level 2 trauma center, the newest and the only one in Hidalgo County. There is talk about trauma center funding at the state level. We want to support the legislator looking at that and, understanding how important the trauma network is across the state, to make sure the funding is fair and equitable; that it is reasonably determined and is accessible to all the communities, not to select communities or select providers. That is an important issue they will grapple with,” Stark said. Another top issue for STHS is ensuring a meaningful discussion takes place about student loan forgiveness. “How do we help create more jobs in the state, jobs around nursing and pharmacy and healthcare and physicians? Because there is such a shortage,” Stark said. Stark said this is where the greatest need is. “We are graduating wonderful residents, greatly trained physicians but increasingly they are going into hospitalist medicine roles or emergency departments, and they are not doing primary care. That is a lifestyle choice,” Stark said. Stark said he is sure legislators understand the importance of these healthcare issues. 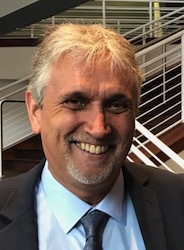 Stark was appointed STHS’s regional vice president in June, 2018. In this position, he has regional responsibility for hospitals in the McAllen, Edinburg, Laredo and Eagle Pass markets. Prior to joining STHS, Stark served as chief executive officer of Brookwood Baptist Medical Center in Birmingham, Alabama, whose operations included a 645-bed acute care hospital specializing in heart and vascular services, women’s services, neurosciences and orthopedics, behavioral health and free-standing emergency department services. Stark previously served in a number of leadership roles including President and CEO of Columbus Regional Health System (now Piedmont Columbus Regional) in Columbus, Georgia, President and CEO of Firelands Regional Health System in Sandusky, Ohio and Senior Vice President of the Acute Care Division of HealthSouth Corporation (now Encompass Health) in Birmingham, Alabama. Stark earned both his Bachelor of Science degree in Psychology and his Master’s Degree in Healthcare Administration from Duke University. In his presentation to visiting lawmakers, Stark pointed out that hospitals are often the biggest employers in their communities, as well as being safety net organizations for those with limited to no healthcare insurance. Stark said STHS is the largest healthcare system south of San Antonio with six campuses. “We see over 152,000 (patients) in emergency departments each year,” he explained. On the issue of a Level 1 trauma center, Stark repeated a fact Valley Baptist’s Vela had made at the outset of the Valley Legislative Tour. That in terms of clinical operations, Level 2 is just as high as Level 1 for a trauma center and that the difference between Level 1 and Level 2 relates to research and education. “We’ve got a wonderful relationship with UT Rio Grande Valley and we are prepared to embark on the research component so we can be that first and dependable Level 1 trauma center for the Valley,” Stark said. He noted that STHS has 2,400 employees, 700 physicians and 495 that completed 69,000 hours of volunteering in 2018. STHS is also a major economic engine, Stark said, noting that it paid out $184 million in salary, wages and benefits. “Hospitals are incredible economic engines,” he said. Stark said STHS would be part of the Rio Grande Valley Partnership’s “Day at the Capitol” in Austin on Feb. 5.